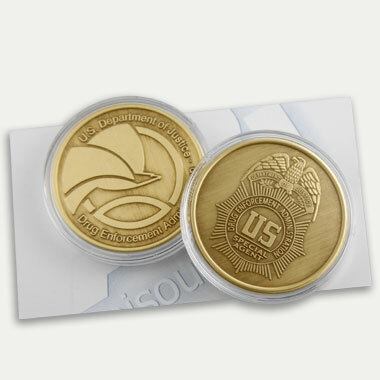 This ever popular die struck 1½" DEA Coin has the Seal and Badge on opposite sides and comes in a plastic capsule. If you collect coins, you may be interested in the 8" Coin-Ready Display (Item# CM0908) or the 16" Coin-Ready Display (Item# CM0916). Or for a really beautiful gift, try the Coin-Ready Display Frame (Item# CM2011).